Spent last night perusing the daguerrotype collection of art world fixture Patrick Callery, who also happens to have a dog named Po. So, this being Halloween, the image above seems highly fitting. 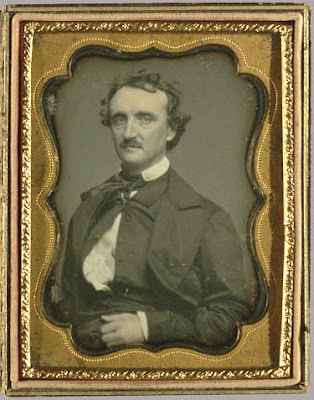 According to Poestories.com, William Pratt made this daguerreotype of Poe about 3 weeks before he died in 1849 at age 40. Poe, arguing that he was not suitably dressed, was coaxed upstairs and photographed. I like this. I would totally hang it in my apartment. I need more things on the wall.